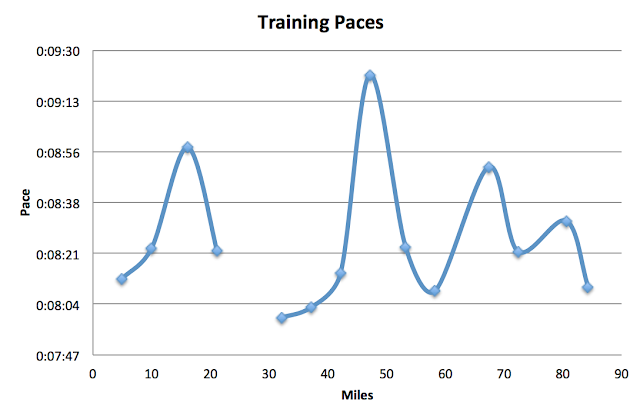 I ran my first tempo run of the training plan. I'm not sure what the direct benefit is, but I guess I'll trust the experts. A tempo run starts and ends at a slow pace but builds (still slowly) to a full sprint right in the middle. This morning called for a 30 minute tempo run. I took a few days off as I was traveling, was in south Georgia (where it is hot), and wore myself out last Saturday enjoying a Tabata exercise. I didn't know I could be so sore. There were little muscles (very little) that were screaming. And why was it so bad three days after the workout? As promised the first running data (to help you make your donation multiplier wagers). An 8:51 pace needed to be under 3:52 for the marathon. Solo and friend runs included. Some are un-timed as I forget watches. I feel like I am perpetually late to the party. As I started getting into the running many of my friends were losing interest. I mentioned the Tabata program to friends to find out they all knew of it. And as to my well documented yogurt making habits (batch in the oven now), everyone made it, and gave up on it in the '70s. Will I always be behind? Tabata, for the one other person who didn't know, is a high intensity interval training (HIIT) program. My surprise Tabata program started after an 8 mile run and included a 15 minute warm up of jumping rope and running an agility ladder. The first set of intervals was 20 seconds of pull-ups, alternating with 20 seconds of pushups. The combination was repeated four times. Then it was weighted sit-ups and crunches perched on top of a ball. Finally, I threw around a kettle ball and did kettle ball lunges. This was followed by a cool down of more agility ladder and jump rope with some stair sprints too. If I exercised like that all the time then things would be different. I just might. Anyway, I give two thumbs way up to the Tabata program and coach Craig who had a garden hose ready to wash away vomit. Now that's a full service gym.